Meet Motola, a 48-year-old female elephant who lost her leg 10 years ago after she stepped on a landmine at the Myanmar-Thai border. 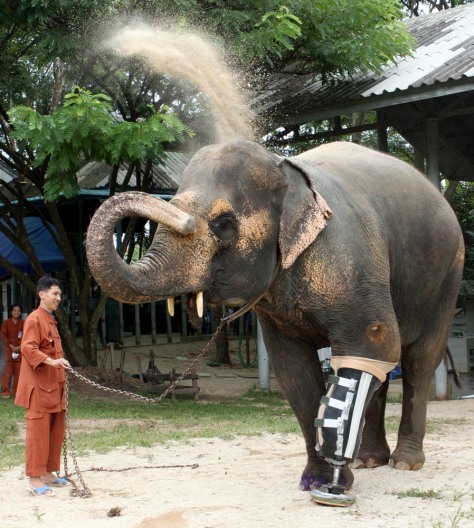 After three years wearing a muscle-building trainer, Motola received her permanent prosthesis in August at the Elephant Hospital in Northern Thailand, courtesy of the Prostheses Foundation. Fuji, a 28-year resident of the Okinawa Churaumi Aquarium in Japan, is the beneficiary of rubber tail fluke designed by volunteers at Bridgestone tire manufacturer. 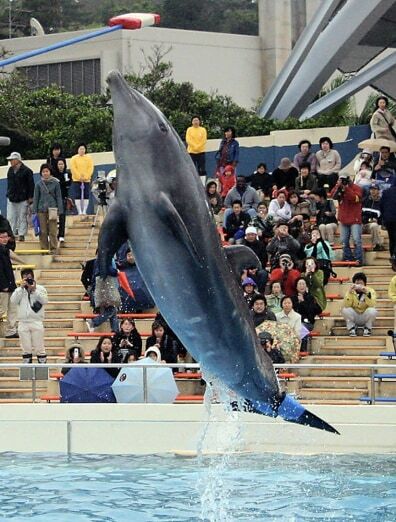 The female bottlenose lost 75 percent of her tail from amputation required to stem a disease. Eight years ago, an inspired maker of human prosthetics came to the aid of mixed-breed collie named Maulee after she lost her paw in a wheat-cutter accident in Shady Dale, Ga.
Daniel Holzer, owner of Able Prosthetic Care of Conyers, Ga., boned up on canine anatomy, observing gait and range of motion. Copying the Flex-Foot design, the prosthesis used by many athletes, Holzer fashioned a new front leg for Maulee using a one-inch thick piece of wood, later adding a strap to guard against the brush she encountered during her romps, and latex to prevent slipping. Three years after she was rescued from an Alaskan landfill, slowly starving to death due to a bullet lodged in her beak, a 7-year-old bald eagle named Beauty received a gift that made her life a whole lot easier. Engineer Nate Calvin spent 200 hours perfecting an appliance for the bird, whose lost upper beak exposed her sinuses and tongue, making it difficult for her to eat, drink and preen. A dentist, veterinarian and other experts joined the project, which included computer scans of actual beaks to build an accurate mold. Pity Pierre. He’s the 26-year-old African penguin at the California Academy of Sciences whose senior feather loss left him high and dry while his 19 tankmates frolicked in the water. A suspected shark attack left Allison, a 5-year-old sea turtle, with a single flipper and a life spent swimming in circles. Now she has her own sharklike dorsal fin -- a carbon-fiber rudder on the back of a black neoprene suit that covers three-quarters of her body, and allows her to swim in any direction. It didn’t take a team of scientists to come up with a solution to help Lucky, the Petaluma, Calif., turtle believed to have lost his front legs to a backyard racoon attack -- just one creative veterinarian surgeon. If anyone’s benefitting from the growing field of animal prosthetics, it’s Boonie the Washington State goat. The 4-year-old farm animal inadvertently wrapped a rope around his front right leg, and the loss of circulation led to the leg’s loss. But Boonie’s owner, Mara Peterson, wasn’t about to leave her 190-pound pet limping.